You’ve heard of smartphones, smart cars, and smartwatches. But have you heard about smart pills? Scientists are working to develop edible sensors that detect intestinal illness. They’re packing tiny electronics and millions of genetically engineered living cells inside a pill. Someday these high-tech tablets could help spot health problems from inside the body. How gracious God is to allow for scientific developments that improve human health! The new pill is the latest advance in a growing field of wearable and swallow-able sensors that monitor health. Pills equipped with cameras, thermometers, and acid gauges already detect disease and track digestion. And Band-Aid-like skin monitors detect muscle movement to help recovering stroke patients. 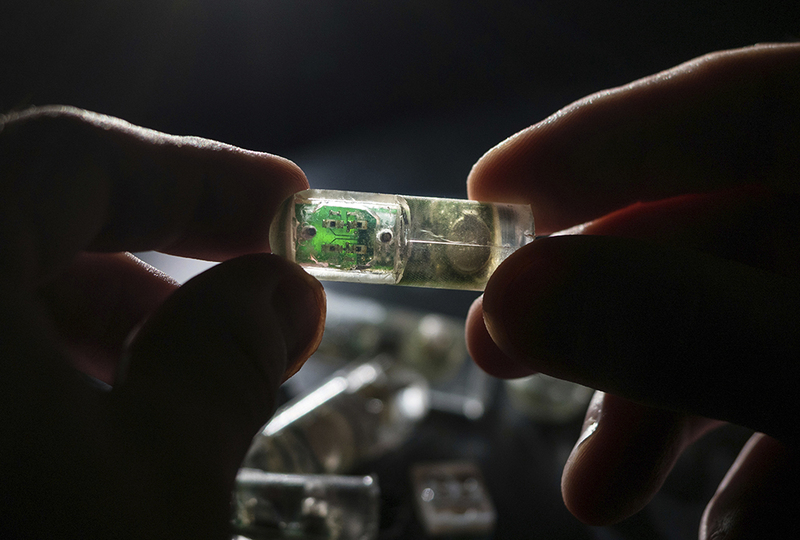 Recently, researchers at the Massachusetts Institute of Technology (MIT) published findings on a new pill sensor in the journal Science. Co-author Kourosh Kalantar-zadeh and others tested versions of the capsule in pigs. The researchers started with a common, harmless bacterium. They injected carefully selected genes into the bacteria cells. Those altered cells could detect blood. The blood detection made them start glowing. After that, electronics took over. The pills relayed signals to a smartphone. 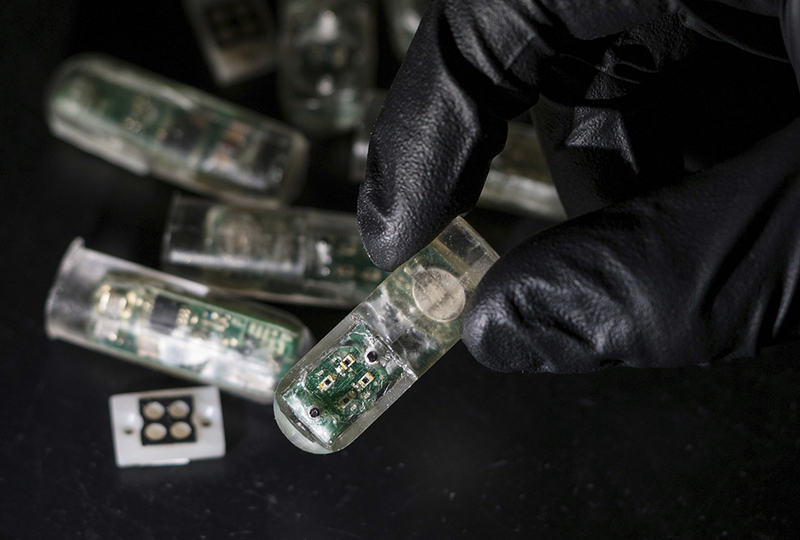 MIT’s slightly-longer-than-one-inch pills contain a battery, a light detector, and other electronics—along with 44 million bacteria cells. The pills correctly found signs of bleeding in pigs’ intestines. Scientists hope the technology could help doctors locate bleeding in humans—without uncomfortable bowel tests. Of course, pills for people will need to be smaller than pills for pigs. But the pig results suggest smart capsules could someday help find signs of ulcers, inflammatory bowel disease, or even colon cancer in humans. “The work is yet another step toward showing the great promises of smart, ingestible capsules,” says Kalantar-zadeh. According to study co-author Phillip Nadeau, combining the pill’s three electronic chips could shrink the capsule to a normal size. Concerns about patient privacy and hygiene could be solved by using data encryption—and by making the pill flushable, says co-author Mark Mimee. And of course, the pill will need rigorous testing in humans—not just animals. Tackling those challenges means smart pills won’t be available soon. But someday, these capsules could help diagnose serious health conditions. And while swallowing a capsule won’t replace seeing a doctor, it may allow some patients with chronic illnesses to avoid so many repeat visits. This is cool! But I do understand the concern for privacy. I also think it's really neat that they have come up with another way to figure out if you do or don't have a certain kind of illness, but like Anna C, I understand the concern 4 privacy. I don't think I would take one. well at lest they are figuring out what is wrong with you right?